It's always rewarding to the Team Members to be recognised for their Skills and Talents as Engineers and Designers. 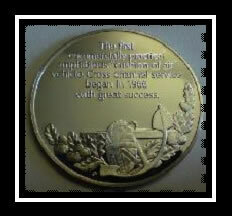 It was truly a special feeling to be be rewarded with the Sir Christopher Cockrell medal for services to Industry. The sceptics may be embarrassed this year and the critics silenced was the word from the whole Team. 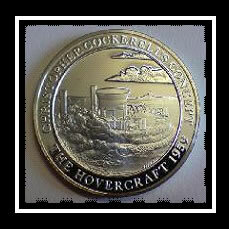 We hold the reward of Sir Christopher Cockrells' medal which was awarded to services for Industry. We aim to take the level of achievement even higher in memory and recognition of Sir Christopher Cockrell. We regularly supply information through our Forum Site which can be found "Click Here"
Formula Hoverpod Manufacture Design Centre uses the latest state of the art equipment and facilities to create an efficient system in order maximise the potential of the craft and develop and ultimately eradicate potential problems at a very early stage. The use of CAD and Fluid Dynamic Simulation as used and employed by Formula Hoverpod Manufacture helps to take concept through to reality in a reduced and real time but with the real benefit of providing a fully functioning end product, prior to lanuching into the mass market. By utlising and maximising the support from our business partners, Formula Hoverpod has managed to take the concept of Marine Applications and combine them with traditional vehicle design methods, in order to produce a totally new design which features state of the art materials and shapes to excitie the very best in the business. The end result is the "Manx GT" which has been supported by some of the worlds finest in creating a Very Reliable and Long Lasting, that is a Very User Friendly product to which the whole family will enjoy many years of fun and excitment when using. The Swipe Card which caused so much interest from parties far and wide last year, has finally arrived. It is designed to provide easy swipe access to the Clubs, with the added feature of replacing your previous or exisiting card details for Banking, shopping and day to day use of ATM Machines. 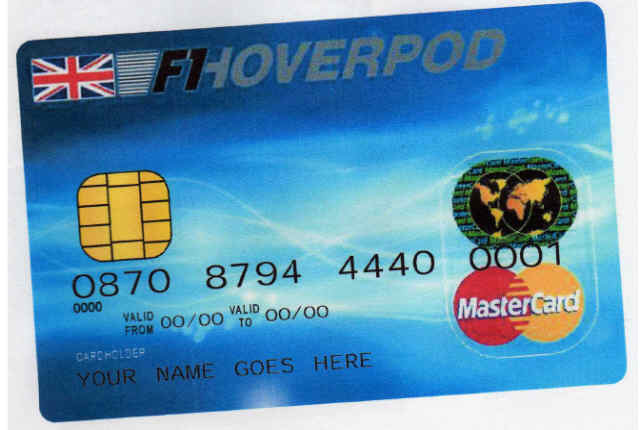 There is much progress at F1 Hoverpod Racing Ltd and we appreciate all your support and encouragement at all times.